Back in 1981 a Japanese anime called Beast King GoLion started something I don’t think the creators could have ever wished for. The show was so popular it was adapted into the 1984 Voltron cartoon many of us grew up watching. It was full of action, great characters and a bit darker than the usual cartoons at the time. If you watched one episode or all 52 you knew you needed a Voltron toy. It could have been a lot bigger at the time too but it was launched about the same time Transformers came out and that shut down a lot of robot cartoons at the time. Now Netflix are showing off just how good they can be with producing original new series. They proved with Daredevil they could listen to fans and deliver a re-imagined successful new series and with Voltron it’s no different. 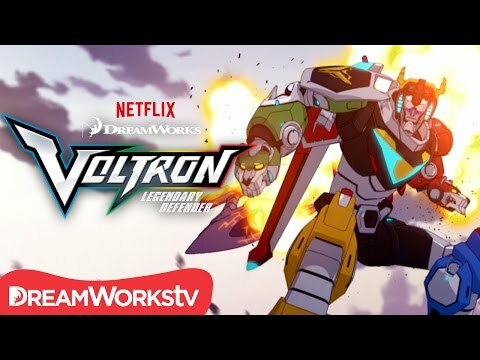 The 2016 Netflix Voltron is a great homage to the original source material. It would have been easy for them to just copy the original series and modernise the animation but they have gone far beyond that. It’s a new take on the original series which has been refined and improved. It’s less dark than the original Voltron and a lot more refined. I think if you were a big fan of the original series you will get a lot out of this one. The back story differs in a few small parts. I think originally one of the pilots died early on in the series, in this one they have Shiro who brings a bit more leadership and mystery to the team. The Princess was also a pilot in the original series but in this one she’s got more of an oracle type role where she explains everything to the team and lets the story move on with each episode. Along with a few other differences it’s a fresh new start but keeps it close enough to not upset the old fans. One thing I haven’t liked about a lot of modern robot cartoons, by modern I mean any made int he last fifteen years or so is how they rely on “modern” CGI which inevitably age really badly. I remember watching Transformers Beast Wars back when that was first out and being amazed, but nowadays it looks really choppy and hasn’t aged as well as the original classically animated G1 cartoon. Although the cartoon does rely on a lot of CGI for the robots and ships they are blended in very well with the other animation. It looks great as I watch it now but I’m wondering if it will still be cool in years to come. One thing they could improve on is emphasis on the scale of Voltron, the fights are great but with most of them being set in space or on alien deserts there isn’t a lot to give you an emphasis on just how big these giant super robots are as you can’t compare the scale, it’s not a problem but just a trick I think they missed out on. This first series is only 11 episodes with the pilot being a double so the total run time is under 5 hours. It doesn’t sound like a lot but they do manage to fit a lot into each episode. Since it has an open end I’m guessing they have already renewed it for a second and probable third series. Overall I’d highly recommend this show to anyone, it’s suited for a broad audience. The story is one of those sci-fi fairy tale types with an ancient lost race, princess with a fine line between science and magic. They divide between the good and the bad are clearly defined and it’s easy to watch and episode at a time or all at once if you have a few hours spare. If I was going to compare it to another cartoon it would probably be the recent Thundercats reboot. It only made one series before it was cancelled but it was an amazing series. It complemented the source material much like this Voltron and modernised it. I can’t wait for Netflix to release more of the show. This first season basically introduces us to everyone and the situation. From this point on it’s going to be full on action.